Pumpkin Patch Match is now available on the Windows desktop platform! Pumpkin Patch Match is a spooky spin on a classic audio pattern matching game. Jack-o-lanterns will light up and display an audio tone in a random pattern. Repeat that pattern to advance to the next level. 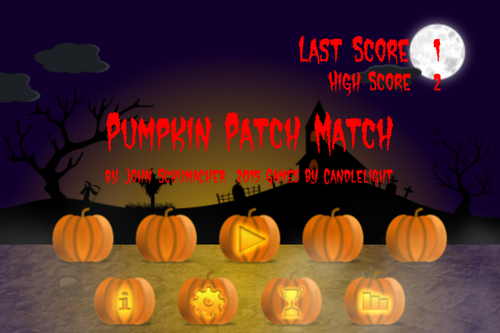 Pumpkin Patch Match will add one more jack-o-lantern to the pattern every time you are successful. If you grew up in the 70s and 80s, the concept of Pumpkin Patch Match will be familiar to you. Great for kids! Fun for adults! Great for Halloween, or anytime! See how many jack-o-lanterns you can pick in a row. If you make a mistake, a second chance is available. Supports English, Spanish, German, Chinese, and Japanese languages. Pumpkin Patch Match was originally released in 2015 for mobile platforms. A Macintosh version will also be available soon.